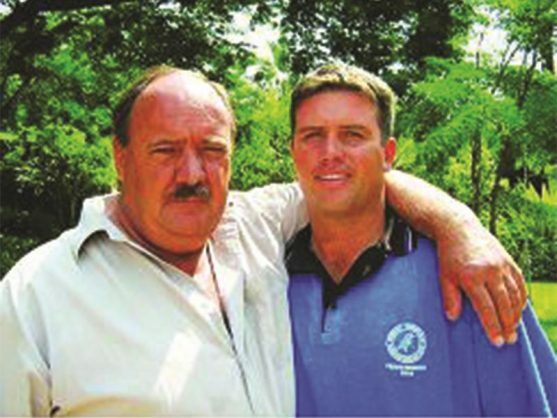 Ronnie Lombard with Billy van Rooyen. Karlien tried desperately to save the lives of her father and her husband. Picture: Vryheid Herald. Nine people were arrested for the heinous double murder. On the morning of February 21, while most of the community of AbaQulusi awaited the chaos of threatened mass protests, inside the courtroom it is business as usual as the Van Rooyen farm attack trial proceeds, Vryheid Herald reports. Accused number four took the stand on Monday to conclude his cross-examination by senior state prosecutor advocate André Ludick. Within minutes, the courtroom fills as the gallery files in to see the accused make his way to the witness stand, his appearance somewhat altered since we last attended the trial. Once clean-shaven, he now sports an intricately groomed goatee and sideburns as he is sworn in and steps up to face Ludick’s line of questioning. The accused claimed police assaulted him and that charges were laid by him on the Sunday following his arrest. He did not inform the court of this charge during his first appearance. Ludick puts forth that Sibiya and Ncele, two of the co-accused, testified that accused number four “brought a bag of firearms to the Combi before heading to Swart Mfolozi”. Zulu, the accused on the stand, responded by claiming that they were lying “to cover for those who were with them in the commission of the attack”. Furthermore, he denied any knowledge of the firearms and alleged he had nothing to do with the attack. Ludick then pointed out that, during the attack, Zulu took possession of the R1 rifle while accused number 1 took the AK47. Zulu denied this and claimed he had “never even been to the place” in question. He also denied he pointed the R1 at Karlien van Rooyen. The interpreter translated, with clarity, how the accused declared that Karlien van Rooyen did not describe him in her testimony. Ludick brought up the testimony of the investigating officer on the case, Captain Attie Engelbrecht, which stated that the firearms were recovered near the home of the accused. Zulu recalled Engelbrecht’s testimony to this effect but maintained he knew nothing of it. Photos were presented to the court of the firearms in question, as well as unfired ammunition found in yoghurt and Vaseline containers, and Zulu maintained he had no knowledge of any of this, even as it came to light that the person who reported the firearms is the accused’s brother, who appears in some of the photos. “I never saw any firearms at my home at all. At 10.15am, the court adjourned for a short break after the accused declared he could not have been involved in the attack as he was quite certainly at home when it took place due to the conditions of his parole. Ten minutes later, court was back in session and Zulu is reminded that he is still under oath. At this point, the accused revealed he had no idea why his co-accused, Sibiya and Ncele, would accuse him and maintained adamantly that they were “protecting the perpetrators of this crime”. Zulu, who has been resolute in his denial of any knowledge as to why his co-accused would implicate him in the attack on the Van Rooyen farm, then revealed that Sibiya’s claims that he was involved were due to a conflict that he had with one of the families linked to Sibiya. He reported that he was told by the other prisoners that Sibiya had said that he (Zulu) was “lucky to be alive” as Sibiya intended to shoot and kill him… Zulu then cited revenge as Sibiya’s motive for implicating him. “Why would Ncele want to implicate you?” asked advocate Ludick. Throughout the cross examination, Zulu maintained he knew nothing of the attack and denied his involvement. He claimed all of the evidence was fabricated and all who identified him to the court, including Karlien van Rooyen, were lying to the court. Zulu returns to the dock, alongside his remaining co-accused, and his attorney, Rinesh Sivnarain, presents evidence that the assault charge was laid by Zulu. The documentation is accepted as evidence and court adjourns for tea at 11am.